When mum-of-four Allyson Proudfoot was looking for new ways in which to use excess milk produced by her nanny goat, she had no idea that it would lead to a new “green” business venture. But almost 12 years on, she runs the Bellingham Soap Company, a successful ethical skincare company from her home in Northumberland. “It all started really because of Lottie, our much-loved nanny goat. She produced so much milk that we just couldn’t use it all – even though I was making cheese, pouring it on cereals – and feeding pints to the cats!” she said. Initially, Allyson made soap as a hobby and gave it to friends and family but as the mountain of soap grew bigger, she decided she’d better try selling some of it …. to raise cash for more ingredients. She started selling at farmers’ markets and craft shows, but quickly expanded and moved into a craft workshop complex. Pretty soon, however, her retail sales were dwarfed by the number of trade customers she’d attracted so she gave up the craft workshop – and moved back home. “We found a farmhouse near Haltwhistle with space for a three-roomed workshop – and it’s wonderful to be working from home again,” says Allyson. 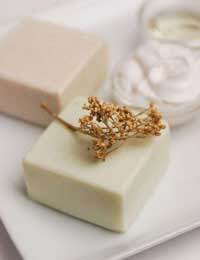 Her soapmaking skills have grown along with the business and she now produces a wide range of ethical and natural skincare and bath products. She has set up an online shop where people can view and buy the products – and it has received national publicity in women’s magazines like Prima and Marie Claire. Her products, which include gift packs for special occasions, are made with essential oils like cinnamon and orange and feature traditional ingredients such as lavender, castor oil, nettle, dandelion and herbs. Allyson buys her ingredients from sustainable sources whenever possible – but sadly this means she is rarely able to buy locally. “I have to get my organic palm oil from a sustainable plantation in India,” she said. “I’d love to buy locally if I could but it’s difficult to find organic suppliers for lots of the ingredients I use. Once cut, the soaps have to sit on drying racks for four weeks to cure – so it’s not an overnight process by any means. Born in Newcastle, Allyson grew up a city child but always wanted to live in the country and she is thrilled with the way things have turned out. “I’m very proud to say that the business is carbon neutral – we have virtually no waste. We always recycle any packaging that we receive and we only use recycled or biodegradable packaging. “To reduce waste we hand-cut our own paper to order and print our own labels and we do everything possible to ensure that we have a minimal impact on the planet.”In short, the Bellingham Soap Company is absolute proof that you don’t need to cause damage to the environment in order to run a successful business. “As a family we also do all we can for the environment,” said Allyson. “Weuse biomass for heating, buy food from local producers whenever possible, and recycle and compost everything possible.